Author: Wilfrid H.G. Haacke. Series edited by: Rainer Voßen. 16 pp. Roman, 233 pp. Khoekhoe or Khoekhoegowab (formerly known as Nama/Damara) is a Central Khoesaan language. It is spoken by the Nama, the Damara, and the Hai//om in Namibia. In linguistics, Khoekhoe achieved prominence in 1938 through D.M. Beach’s linguistic study, The Phonetics of the Hottentot Language. The present publication builds on Beach’s classic and elaborates his phonetic study into a study of the tonal system of Khoekhoe, based on data drawn from a lexicographic project instituted by the author in 1981. 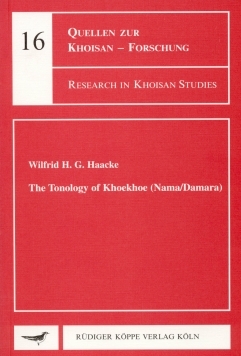 The study furthermore fills a gap in modern Nama research, since, with few exceptions, recent publications on Khoesaan languages mostly neglect Khoekhoe (Nama), even though it is officially recognized for literary purposes in Namibia and is taught as a major degree course at university level. Following the introduction Chapter 2 presents an instrumental analysis of the surface tone of radicals. Chapter 3 deals with the formation of compound words and derivations in the realm of lexical tonology. Chapter 4 presents an overview of the post-lexical tonology with regard to the major syntactic structures. It is demonstrated that Khoekhoe corroborates a universal, namely that tonal domains coincide with independently established syntactic domains that commence with a double left bracket in a bracketed representation of an IC structure. To sum up, Khoekhoe tonology has semantic as well as syntactic and derivational functions.